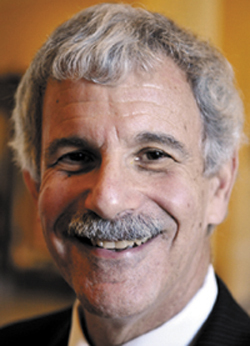 Two Vassalboro town officials urged Sen. Roger Katz to push the Legislature to raise the lodging tax as one alternative to cutting municipal revenue sharing during a meeting Thursday. VASSALBORO — Two town officials told Sen. Roger Katz Thursday night that the Legislature should consider raising the lodging tax instead of cutting municipal revenue sharing to balance the state budget. “I don’t think towns and cities can absorb that hit without raising property taxes,” Selectman Philip Haines said. “I don’t know of a state that has lost tourist business because of the lodging tax,” he said. Elizabeth Reuthe, a budget committee member, said when she travels, she notices other cities charge lodging taxes that are easily 15 to 20 percent. Katz, an Augusta Republican and assistant Senate minority leader, asked selectmen and the town’s budget committee for suggestions about where the Legislature should look to balance the state’s $6.2 billion budget. “The suspension of revenue sharing has run into a fair amount of opposition,” he said. Katz noted that state law calls for cities and towns to get 5 percent of sales and income tax collected, but in recent years, they have received only 3.6 percent. He’s sponsoring legislation to increase the amount back to 5 percent over three years. Katz said while it’s easy to oppose the two-year suspension of revenue sharing, he and other lawmakers must propose alternatives. Ideas being bandied about in the halls of the State House include more reductions to state government, delaying income tax cuts passed two years ago, raising the sales tax, cutting education funding and further reducing MaineCare eligibility, he said. Katz asked those gathered in Vassalborog whether they thought there was room to save money by consolidating services. Selectman Lauchlin Titus said in towns as small as Vassalboro, there are few services that could be shared with other towns. The firefighters are volunteers, there’s no municipal trash pickup, the assessor works one day a week on a contract basis, and the schools joined a regional system when the state mandated it a few years ago. Rep. Lori Fowle, D-Vassalboro, who is also a member of the town’s budget committee, said school consolidation did not save town taxpayers any money. “Dollarwise, it didn’t do what the plan was supposed to do,” she said. Katz said there is discussion of finding ways of exporting more of the state tax burden by raising the meals and lodging taxes, broadening the sales tax and possibly finding a way to tax out-of-staters who have second homes in Maine. Katz said he would not favor raising taxes on the rich, because he wants the state to attract more businesses.